Motorcycles owe a huge debt to bicycles. The invention of the ‘Safety’ frame in the mid-1880s – the same basic chassis used on 99% of bicycles today – inspired builders to hang a motor inside, from their very first appearance. After experimenting with every possible engine location (even on the handlebars! ), the issue was more or less settled by the ‘Noughts, with a motor down low in a safety frame. 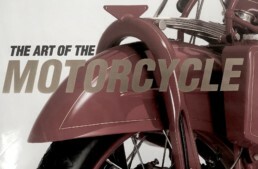 As the Century progressed, motorcycle frames got heavier and more specialized, eventually diverging from bicycle technology via pressed-steel monococques (from the late 1920s), beam-frames of wood, steel, or aluminum (all 1920s inventions), and double-loop frames like the Norton Featherbed (1950s). Motorcycle designers first tried streamlining in the 1930s for Land Speed Record attempts, and from the 1950s onwards a lot of research went into fairings and other wind-cheaters. Bicycles rarely used fairings except for speed and distance records, and in competitions sanctioned by the UCI (Union Cycliste Internationale) fairings are banned entirely. The crude plastic bubble fairing sported by bicycles today are only seen on a few recumbent bikes, and are the same as Burt Munro used on his Velocette beach sprinter in the ‘50s thru ‘70s. 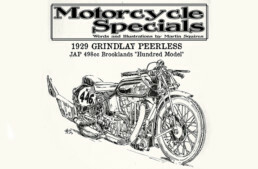 But production motorcycles are decades ahead of bicycles in the streamlining game. 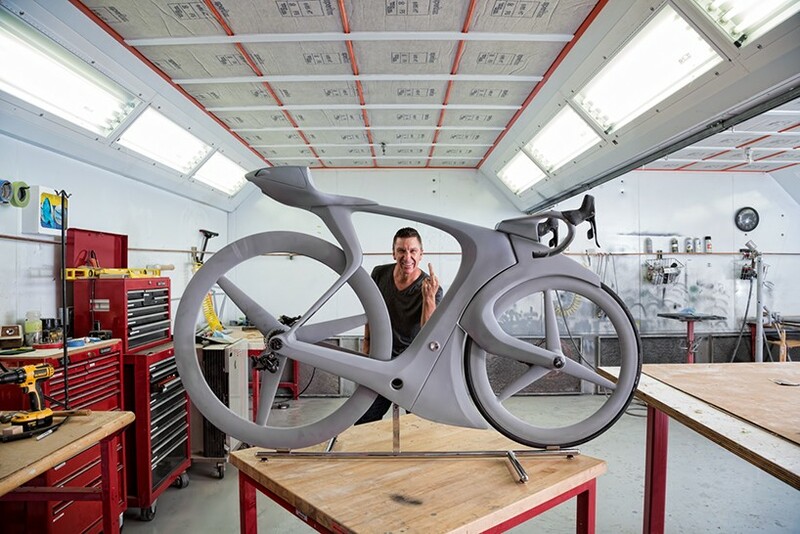 A few cyclists resent this fact, and one in particular, Robert Egger, creative director of Specialized Bicycles, decided on a major upgrade with clear motorcycle inspirations. 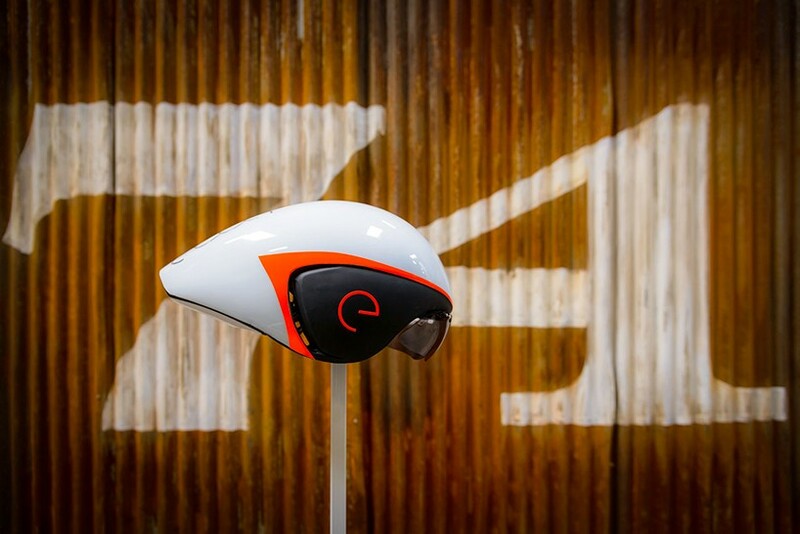 It might seem old hat to moto-folks, but Egger’s hawklike nose fairing is a flipped bird to UCI rules, from a company which supplies competition bikes…and worse, it includes an electric motor in the undercarriage. 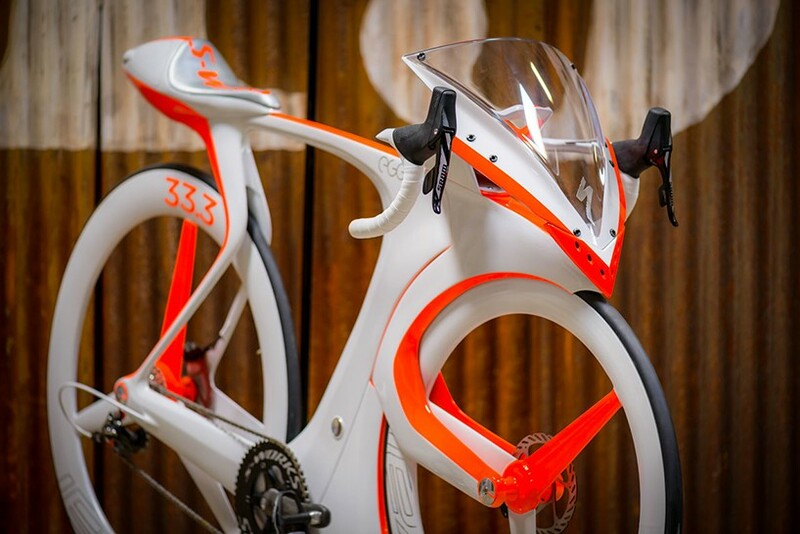 It’s an electric sports-racing bicycle, appropriately named the fUCI. 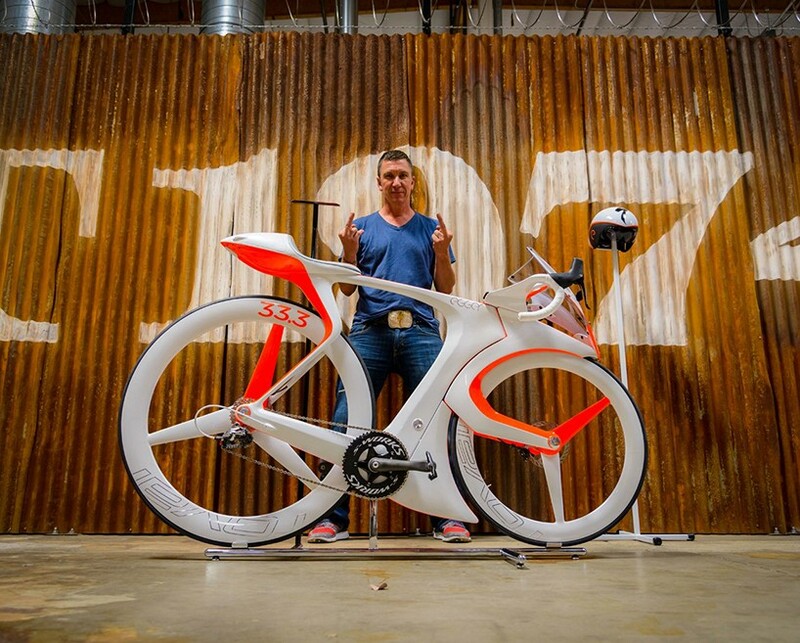 “‘This is an e-bike. 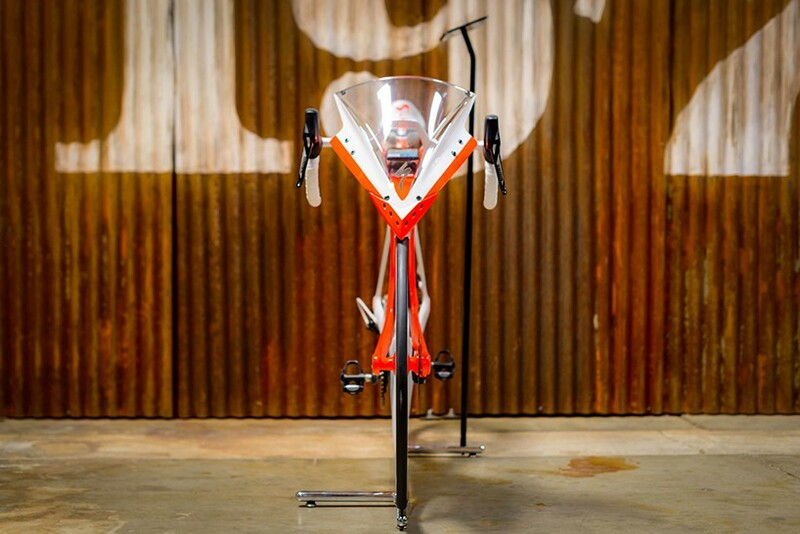 It has a motor here, in the bottom bracket, so just like when you ride a turbo and you put your foot on the pedal and it lurches forward, the same thing here. this little motor will get the flywheel up to speed so when you’re stopped at a stop sign, or when you’re starting out of your garage in the morning, this’ll be that burst of power to get the flywheel up and running.” Zzzzip! UCI technical regulations require both wheels be the same size, but Egger went big out back with a 33.3” wheel, which acts as a flywheel to conserve high speed energy. 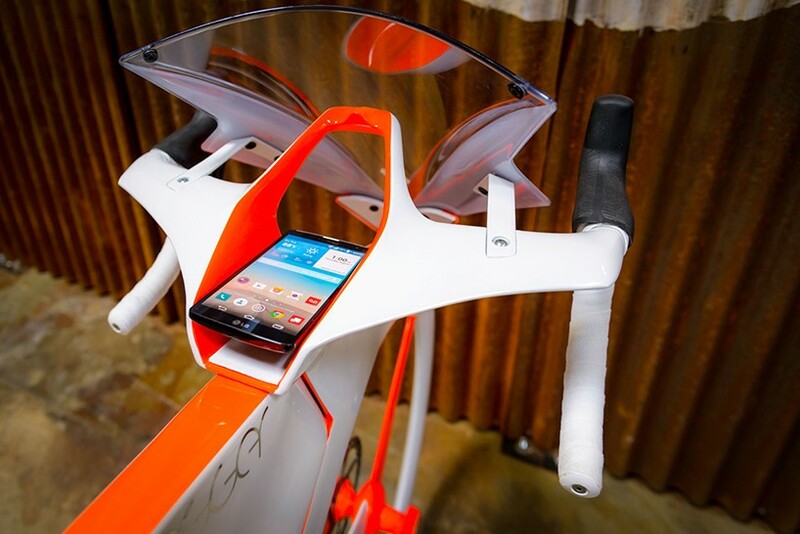 A lithium battery for the motor is removable, but Eggers build a stand with a solar charger, so there’s no need to plug the bike into a wall, at least during the day. There’s a head and taillamp, and a smartphone dock to keep track of energy use, tire pressure, speed, etc, and even a mini-locker in the wasp tail for a windbreaker (or spare tube – a maddening certainty with our smaller cousins). The carbon-fiber frame escapes the ‘double diamond’ convention still extant in the bicycle world, and with the big back wheel gives and aggressive, wind-cheating rider position. With the fairing and wind-cheater profile of the tires and frame, the biggest sail is the rider, and a little help in that regard comes from a matching aerodynamic helmet, the modern offspring of Ernst Henne’s aluminum BMW teardrop from the ‘30s. 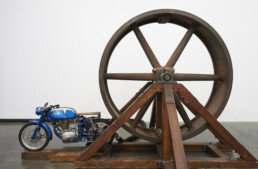 It should be no surprise from the visual cues of the fUCI that Robert Egger is a motorcycle fan. For those of us more likely to wear leather than spandex, it’s intriguing to watch the start of some back-and-forth between our disparate worlds, which will surely increase with the rise of e-bikes. We’re siblings from the same 19th Century crib, and are only starting to look alike at 130 years old. 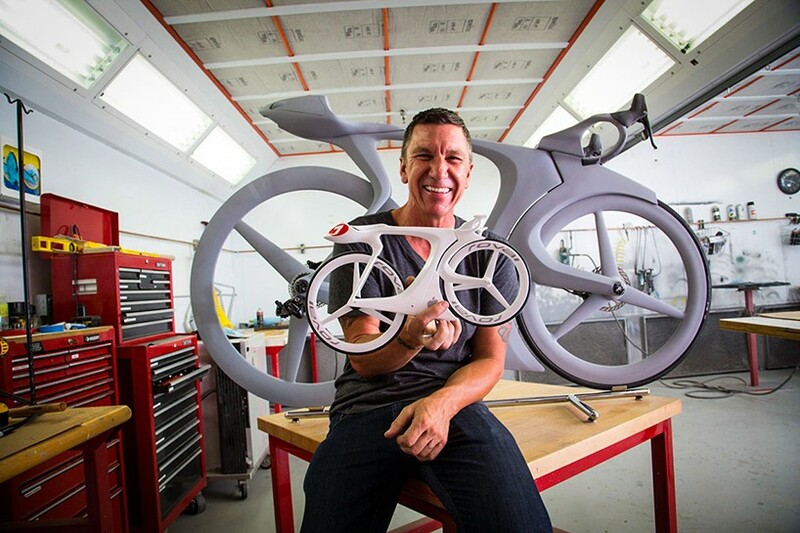 Our pal Robert Egger is the Philippe Starck of the bicycle world, bringing his unique eye for style and fabrication to the pedaling masses. Nice article! Damn as in damn if that thing is half as functional as it is stunning its gotta be one serious beast of a bike to ride . What I wouldn’t give for the opportunity to throw a leg over this bats**t crazy insane ( in the very best of ways ) bicycle ! Hmmm … f*** the rules … damn the safety .. to hell with reason …. the bicycling worlds version of HST’s ” Song of the Sausage Creature ” perhaps ? Hell … who cares .. I’d give it a serious go !